You may be excited to bundle up and enjoy a snow day, but some dogs aren’t so thrilled about going outside in that kind of weather — much less going to the bathroom in it. After all, would you do your business in less than ideal conditions if you didn’t have to? 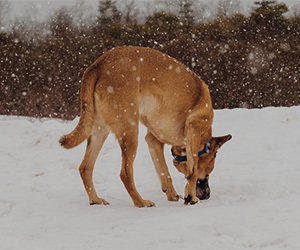 Thankfully, you don’t have to spend the whole winter cleaning up accidents: I have several strategies that can help teach your pup to do his business outside when it’s cold — but you may need to try a combination of two or three of these methods to solve the problem. Snow can make your dog’s outdoor bathroom options less than ideal. He may not want to or his regular potty spot might be buried. You can help him out by shoveling a space where he usually does his business that’s as close to the ground as possible and large enough for him to. If you’re unable to shovel, invest in some potty grass and place it near his regular potty area. Humans aren’t the only ones who should dress for the cold — some dogs may in frigid weather. For instance, if your pup is small or has short legs, he may be more willing to go out in the snow — and go to the bathroom — if he’s appropriately bundled up. Take your dog outside frequently so he has plenty of opportunities. And when he does eliminate in the proper area, praise him and reward him with his favorite treats or a special toy. If he’s up for it, you may even want to have a — or you can head back inside, where it’s warm and cozy. If being cooped up indoors is causing your dog to inside, try to keep him in a contained area. Don’t let him go into areas where he’s had accidents before and make sure you with an enzymatic cleaner, which should help get rid of any scents that will make him think it’s OK to go to the bathroom there again. Once your dog is willing to do his business outside again, you can let him roam freely in your home once more. I know it can be frustrating when a dog goes potty indoors, but him won’t prevent this behavior — it will only make it worse. When you punish a dog for having an accident, it teaches him that it’s not safe to go potty around you and he’ll quickly lose his trust in you. Instead, when he has an accident, gently interrupt him with an “oops” and take him outside to his normal bathroom spot as a reminder.